Associate Justice Maria Lourdes Sereno had been chosen as the 24th new Supreme Court Chief Justice of the Philippines last Aug. 24, 2012. She was proclaimed into office the following day. Being only 52, she may hold office for 18 years until she reaches the mandatory retirement age of 70 by 2030. Amidst the nation’s mourning over Sec. Jesse Robredo’s demise, Pres. Noynoy Aquino had to choose among five short listed candidates from the Judicial Bar Council of the Philippines because there was a deadline. He had 90 days to select from the time former CJ Renato Corona was impeached last May 30. Thus, Sereno was selected. The chosen five were selected from the original 22 nominees (minus 1 who was not even interviewed by failing to submit requirements) who were subjected to both public and JBC scrutiny during the panel interview which was broadcasted over live television. Some of the strongest contenders were not even included in the short list. One of which was Sec. Leila de Lima of the Department of Justice. She was disqualified due to three pending disbarment cases against her. Sereno being appointed as the new SC chief justice is both phenomenal and historical. 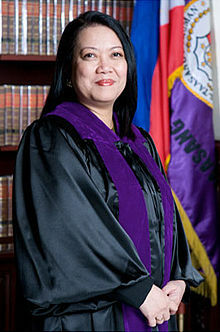 She is the first ever female chief justice in the entire history of the Philippines. The selection process followed was also the first of its kind. The country’s president did not simply choose from his own constituents and rather opened the door for nominations. The live panel interview for SC CJ nominees broadcasted over national television is also something we haven’t seen before. Sereno is actually one of the newest associate justices (former now). She was delegated into the Supreme Court on August 2010 when Corona was appointed by former president Gloria Macapagal-Arroyo into an obviously midnight appointment. This was the same reason why SC even allowed GMA to leave the country to seek medical assistance abroad last year. Sereno actually opposed the SC’s decision to let GMA go but it was Corona who can influence the other magistrates into siding with him. These factors were used during the impeachment trial against Corona. In fact, Sereno was invited to take the witness stand but the impeachment court composed of Philippine senators refused. Corona was impeached not due to this though and was removed from his post by virtue of undisclosed statement of assets and liabilities (SALN) citing the same example of how Delsa Flores, a court interpreter in Davao del Norte was sacked by not disclosing ownership of a public market stall. She was deprived of all her benefits including retirement and was banned from government employment since the court decision in 1997. With Sereno’s stand against Corona’s ruling over GMA’s plight last year, she may not be a direct ally of Malacanang but her opposition to anything pro-GMA is already an indication that she won’t be a nemesis of the current government. It’s not even about being anti or pro-GMA anyway. It’s about whether it is right or not to let the former president leave the country despite pending cases against her. De Lima sympathizes with this thought. She had sent police enforcers at the airport to prevent GMA from departure despite the Supreme Court’s temporary restraining order, allowing her for a flight abroad. The same incident had caused a rip between the SC and DOJ. With Sereno now holding the highest judicial post in the country, the SC’s issue with the DOJ may soon be resolved knowing that both heads of these offices agree on the same side of the law. Despite opposing views on how the law of the land is interpreted; thus, there’s always two sides, Sereno hopes to regain people’s trust on judges again, particularly the magistrates of the Supreme Court. During her interview with the JBC, she points to God as her inspiration and source of passion in life. She further said on quote "When we try to render justice, we are also trying to replicate, mimic, copy the work of God." With that, the new Chief Justice of the Philippines (2012) may exactly be someone the country needs; a person who will not succumb to influential individuals but will stay focused on what’s expected from her job, which is to be an instrument of justice in God’s eyes.